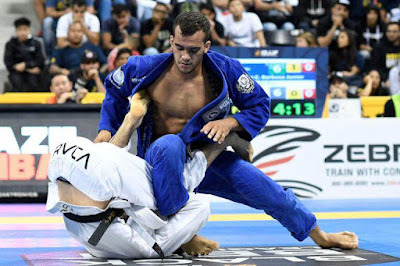 A star of the new generation, this month Marcio Andre once again triumphed in an installment of the European Jiu-Jitsu Championship. Back in the featherweight division after dominating the Berkut GP, the black-belt under Fabio Andrade defeated three opponents in Odivelas, Portugal to win his fourth consecutive European title. After four months, Marcio returned to the featherweight division — the one he had been fighting in since he was a blue-belt. In the final, he swept twice and controlled the guard of Gianni Grippo (Alliance), who had eliminated Isaque Paiva (Saikoo). Before clashing with Grippo, Marcio had gotten past Isaac Doederlein (Alliance), a student under Rubens Cobrinha, on points. Marcio will be back this Friday, Jan. 26, fighting Lucas Lepri (Alliance) in the super fight at Absolute Championship Berkut Jiu-Jitsu 10 (ACBJJ 10) in São Paulo, Brazil.